Hey, you know what movie NOT needed a remake? Spiderman. De original had fun, humor, a great origin story, and a colorful, nuanced villain in Norman Osbore/Green Goblin. Dis new, improved (?) version have half de fun, hardly any of de humor, a not as interesting origin story, and a one-note villain in Curt Connors/Lizard. What next for de Hollywood remake machine? Batman? Les Miserables? Schindler’s List? Peter Parker be a loser. He have no friends. He picked on at skool. FORTUNATELY for him, as ALWAYS happen in real life, de hottest girl in skool fall for him. One day, he comes across dead father’s old briefcase and, inside it, many strange scientific documents. Dis lead him to start researching his father on google – someting he never had any inklination to do before. He diskover father and his research partner, one-armed Dr. Curt Conners, worked at company called Oscorp. Oscorp be a big company involved in all sorts of high-tech research. FORTUNATELY for Peter, none of dis high tech research went into office security which simply consist of woman at desk handing out name badges like candy. No, I.D.? No problem. Just help yourself and have a nice day! Peter wander around sekret corridors and waltz into top sekret lab where he get bitten by a radioactive spider. And before you can say “Here we go again”, he demonstrating superhuman abilities like super strength, super agility, and super douchiness. After giving some poor convenience store owner a hard time, he not bother to help him stop a robber – a robber who end up shooting his Uncle Ben dead! New and improved Peter Parker! Now wit 50% more hair!!! 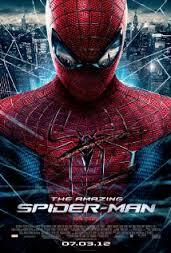 Peter very upset and decide to keep the city safe from crime track down robber who shot Uncle Ben to assuage his own guilty conscience. “He’s tracking down a bunch of criminals that look the same like he’s got some sort of personal vendetta,”remarks Police Captain George Stacy in one craptacularly unsubtle piece of dialogue. …a giant lizard. Seriously. What you expect? A green goblin? Lizard. Just one step cooler den Kangaroo. Spiderman battle Lizard on top of bridge in front of hundreds of witnesses – none of whom seem to remember Lizard guy later so de police just put out an arrest warrant for Spiderman. BUT in addition to battling Lizard, Spiderman also take time to save kid from falling car. We treated to drawn out suspenseful sekwence of Peter trying to convince boy to climb out of car toward him as automobile threatens to plummet. Eventually, our “brilliant” hero remember “Oh, yeah! I have webbing!” and use it to save de kid. After visiting Dr. Connors in his lab and seeing a giant rat eat a mouse, Peter conklude Dr. Conners = de Lizard and report dis to Captain Stacy. But Captain Stacy who not believe him – Why de hell would he? – and den change his mind and mebbe believe him – What? Why? Spiderman track Dr. Connors down to his new lab hidden in de sewers. Seriously. He moved all his lab equipment underground. Wit his one arm. Connors turn into Lizard and fight Spiderman. Spidey get away – but leave behind his camera…wit a Property of Peter Parker sticker on it. Yep, just like Bart Simpson in dat Little Timmy Down de Well episode of De Simpsons except, in dis case, de item in qwestion belong to a supposed “genius”. Lizard attack high school looking for Peter. Cue film’s high point: Terrifik Stan Lee camee. Den, back to middling movie. Spiderman beat him up and chase him into sewers. He phone up Gwen and tell her to go to Oscorp and start working on antidote for Lizarditis…becuz she be a genius too! But on way to help her, Spiderman caught by police. He handcuffed and Captain Stacy pull off his mask. Now EVERYONE know Peter Parker be Spiderman! Well, everyone who happen to be around when city’s most wanted vigilante be captured…exaktly one person: Captain Stacy. FORTUNATELY. Peter tell him his daughter, Gwen, be in trouble so Captain let him go. But Spiderman shot anyway by policeman giving him good luck send-off. Wounded, it not look like Spiderman going to make it. But construktion workers band together and help him by giving him a lift on various cranes (FORTUNATELY) CONVENIENTLY positioned around town. Gwen gives father antidote and father give it to Spidey who try to stop Lizard from dispersing Lizard gas. Spidey get antidote into dispersal unit and, when it blow up, Lizard turn back into Curt Connors who save Spiderman from falling off building…even tho, presumably, he would have remembered he could have used his webbing to save himself. Dying Captain Stacy tell Peter not to involve Gwen in his Spiderman stuff so, after supporting Her and seeing her thru her father’s funeral, Peter be a man and tell her can’t see her anymore…Oh, no wait. Dat OT what happen. Instead, he simply not bother to show up at her father’s funeral and act like a total douchebag, pulling de old “mebbe she’ll break up wit me first!” ruse. But FORTUNATELY for Peter she see magikally see thru it and guess he just doing it because her father made him promise. Great guess! Movie end wit suggestion dey may hook up after all. And her father roll over in his grave. P.S. Mid-credits scene involving mysterious guy in hat do little to whet audience appetite for inevitable sekwel – dat at least a year away. FORTUNATELY.